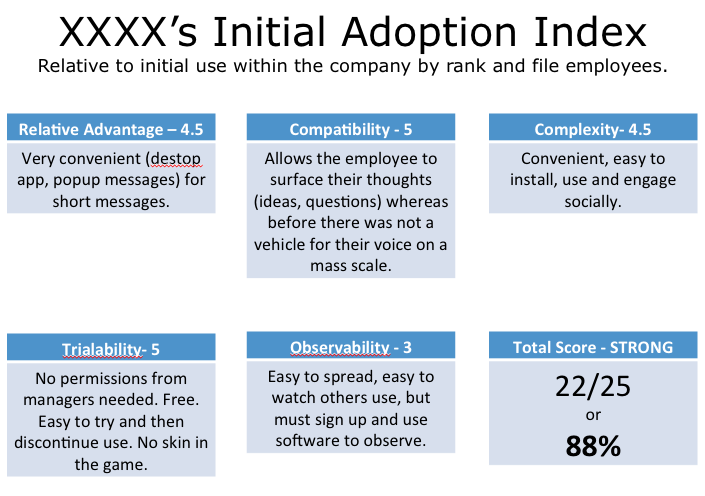 Now that you know the five factors to predict the rate of adoption of your initiative (whether it be social technologies, cultural change, etc. ), let’s put this into something that will give us a measurement. First, you have to pick your target audience. Know who you want to evaluate a tool. Then, take each one of the five and evaluate your initiative against it. Next, rate it – 0 through 5, with 0 signifying that it does not satisfy the factor at all, and 5 signifying that it is very strong in fulfilling this need. Then mutilply the first two factors, Relative Advantage and Compatability, by 1.5 and the others by 1. Why? The first two hold more weight and are particularly telling (according to Rogers). If they all scored 5 then the total score would be 30. I thought about ranking the results (1-30 = Weak …. 85-100=Strong), but I don’t feel that it is needed. Anyone who sees a 75% can tell that there is room to grow and will know where to focus to make is stronger. Again, it is not so much a crystal ball as it is a gauge to help us know where to focus our efforts to increase adoption. Two strengths of this tool are: 1) To quickly find where the holes are and 2) Explain in simple terms why an initiative was or was not (or will or will not be) adopted. As I have used this, I have found that there are two types of adoption to account for. One is Initial Adoption, the other is Sustained Adoption. They are both very different and can show different results. As an example, there is one particular technology I have heard many employees at different companies talk about. It spreads like wildfire at the beginning. The executives get excited that it is working: many people sign up and start using it. But not long after, usage drops off and only a very small fraction of people use it. (In one company with 2 years of using it, there are over 6000 registered users, 25 regular users and 35 using on any given day). Not only is management frustrated, but so are the employees. The result: it isn’t used often. To explain this phenomenon, I evaluated it using the Adoption Index. Looking at the above analysis (although this version does not go into depth for display purposes), you can understand why it is initially adopted quickly. Yet why is it not used after initial adoption? Why do employees drop it? Again, I use the Adoption Index to explain this. There is more behind this analysis, but these are the bare basics. This is only one example of how the Adoption Index can help explain why an innovation or technology will or won’t be adopted. This tool will give you direction on where you should spend your efforts. For example, if your score is low in complexity, you will know where to spend your time and how to focus to make your initiative more successful. I have used this with initiatives to simply explain to executives and management why their products or initiatives were not as successful as they had hoped. Unfortunately, I have not used it to show why their efforts were much more successful than they anticipated, only because this rarely happens. But I hope to one day. Feel free to use and give suggestions on how to make it better. I hope it will help you explain past initiative’s adoption rates and predict future ones. Here it is in PowerPoint format. 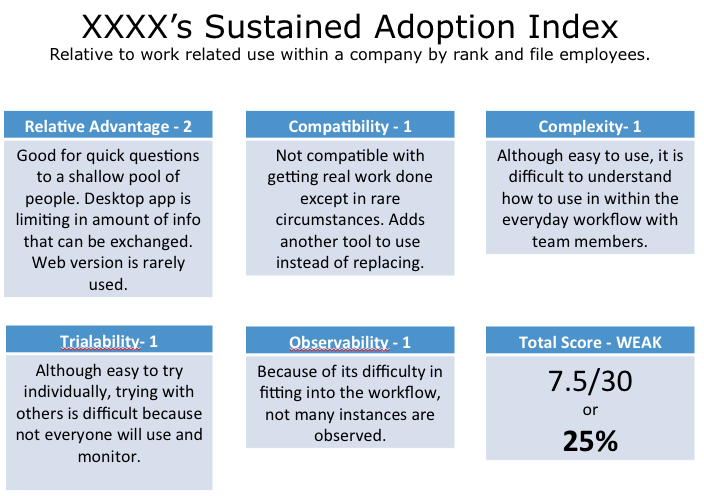 Adoption Index by Kevin D. Jones is licensed under a Creative Commons Attribution-ShareAlike 3.0 Unported License. Based on a work at Diffusion of Innovations by Everett M. Rogers. If only we could predict how quickly our initiatives will be adopted! Then we could focus on those that will yield high returns and we could reduce the risk of failure. But… those people! They always mess things up! Even when we think we have the perfect product / technology / purpose / program, people mess it up! While I can’t give you a crystal ball, I have found a useful way to evaluate initiatives and determine a rough prediction of the rate of adoption. To be honest, this could be for anything – any product, process, technology, social initiative, chore chart program for your kids… But let’s focus on making major changes within your company. One of my favorite books is Diffusion of Innovations by Everett M. Rogers. Although this largely academic book was originally written in 1962, it hasn’t lost any of its usefulness. It explains why innovations and technologies – in the true sense of the word – are adopted, or not, and at what rate. Rogers explains that there are five factors which have the most weight in the outcome. I will briefly explain each in context. To many, social technologies are just another thing they have to check. Rather than realizing that it supersedes anything, they see that it is an addition to what they already have to do. And they already don’t have enough time! Convenient? No way! Satisfaction when there is perceived information overload? How do we combat relative advantage when it comes to implementing initiatives at your company? Contrary to popular belief, an ROI will not convince them. It will help them get over an obstacle, but I have never seen someone walk away from a presentation on ROI energized and excited to tackle a new organizational project. At this point it is stories and examples and case studies which spark their imagination. In a large part, it is a process of education and perceived application. When I work with companies, this is often referred to as CULTURE. What values, traditions, beliefs to employees hold to tightly? And how does the new technology match up with the culture? This is an especially tricky one because with social technologies within the workplace it almost always matches up well with the values of the company. Yet the operative word in the description above is PERCEIVED. How are social technologies perceived? As time wasters, one more system to learn, a fun platform, full of noise, and the list goes on. One way I have broken past this is to show the Party Planning video. It breaks down preconceived ideas and they suddenly get it. They had a different perception of what “it” was. Suddenly they get a peak into what it REALLY is and they realize how well compatible the values really are. This, now so much more than before, is increasingly important. In this world of clean and simple UIs and Twitter, we feel we should be able to look at something, or read it, or experience it and instantly understand it. If it takes time (precious time that employees don’t want to give up) to understand, then often it is not worth the effort. And then if they try and it is as difficult as they thought, this creates another obstacle. They gave it a try, it wasn’t worth it and so they go back to the old way of working. Not all innovations can be experimented with. For example, a new organizational structure often just needs to happen, rather than be experimented with. And again, our modern culture has set the expectation of free trials, subsidized technologies and throw away products, ideas, and methodologies. The danger here is that the latest so-called fad is not experimented with deeply enough to understand it. We tend to cover the surface, hoping that the learner will dive in deeper. But they too often do not. Yet the easier it is to dive in, try it out and come back to their safe place, the more likely it is to be experimented with. The more this happens, the easier it will be to process into their own values. Not only are they looking for the stated result, but they are looking for the unintentional results sometimes even more. For example, rather than agreeing to forgo a vacation policy and allow each person to keep track of their own, they want not only to know the financial impacts, but if people will abuse the new policy. To them it may be obvious – again we are talking about perception. I must point out that this is only skimming the surface. To really understand this (and make the tool more useful) I would suggest buying the book and going through at least the first couple of chapters. 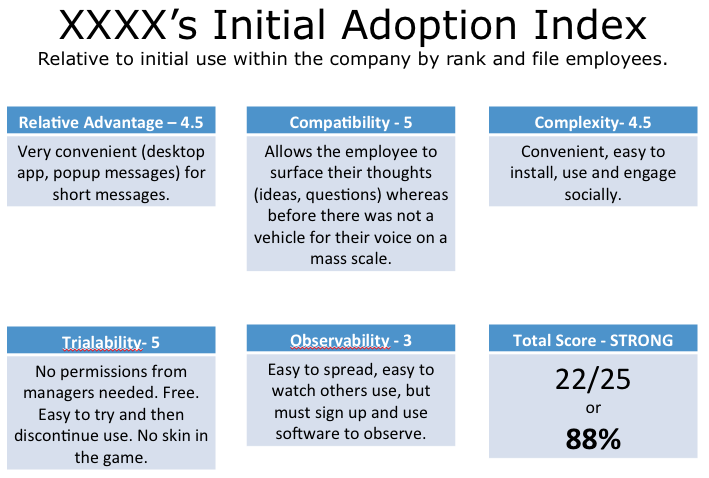 In the next post I will explain how we can use these factors to guage the rate of adoption of your initiative. There will also be examples of how I have used it to show adoption rates. It may be an indicator, something that tells us how we are doing in other areas. But should it be a goal? I don’t think so. When I see things about “increasing the innovation within an organization” I get it, but it seems that it focuses too much on the process and not on what we want in the end. Again, we can think of Umbrella Principles – those which encompass others. For example, focusing on trying to smile at everyone you meet is a fine goal. Except it is a lower order goal. Trying to be kind to everyone you meet is higher order and will usually result in the lower order goal happening naturally. That’s how I see innovation. If we are trying to increase it within an organization we are focusing on the wrong goal. Look for a higher order goal which will make it happen naturally because of the environment which it is in. If innovation isn’t happening (and we want it to) then that does not mean we should focus on it. Rather, focus on the environment that causes innovation to freely flourish. Of course, you have to create the right environment and not think that changing the decor will drastically increase innovation. And just for fun, a little bit of creativity….